If you own a valid Uni account you are provided with a XMPP account. XMPP is a Internet communication protocol. Like e-Mail, XMPP servers can communicate between each other. This means you can write to and get messages from persons that do not have a JGU account. Because of server to server communication, a XMPP address looks like an e-Mail address and consists of username@provider. At JGU XMPP can be reached at jabber.uni-mainz.de . 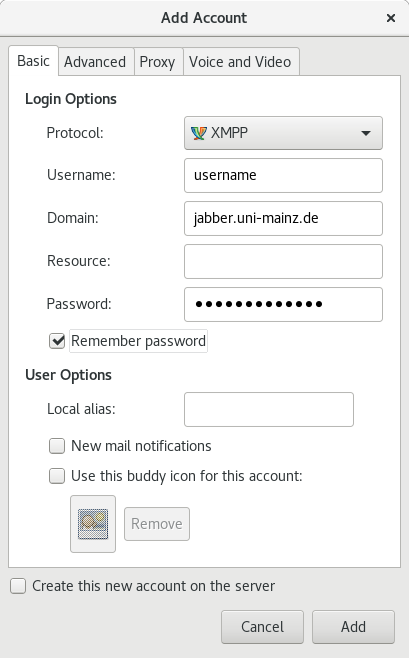 Your personal XMPP address is Username@jabber.uni-mainz.de. Because XMPP is a protocol you are not tied to a specific program. Programs are available for all common systems (Windows/Linux/Mac/Android/iOS). A (partial) list with available programs can be found here. XMPP stores your contacts on the server. This means you can access all your contacts, no matter where you log in from. Adding contacts performs two different tasks. You can start chatting with every Person you know the XMPP adress of. If you close your XMPP program, you need to enter this address again to start chatting. If you add a person to your contact list, you may start chatting by clicking on the persons name. In addition to your XMPP address, you may provide additional information like online status, profile picture, e-Mail address, telephone number etc.. For another person to see this information you need to authorize them. If someone adds you to their contact list, you get a request to authorize this person to view additional information. XMPP may be used for group chats. Chatrooms may be configured to suit different needs. For this purpose, different options are available. These options can be combined to create e.g. a public room where only specific persons have write access. A temporary room gets deleted if the last member leaves the room or goes offline. A persistent room is preserved even if all members leave the room or go offline. A public room will be announced on the server. Every person can see this room. A hidden room is not announced and you need to know the room name to find it. The room is only accessible for members. Other people cannot enter this room. Every person who wants to enter the room needs to enter a password. Only people with write access can send messages. Other people still have read access. This guide will explain how to set up your XMPP accout using Pidgin. We choose Pidgin for this example because it runs on Windows, Linux and Mac. A list of different programs can be found here. 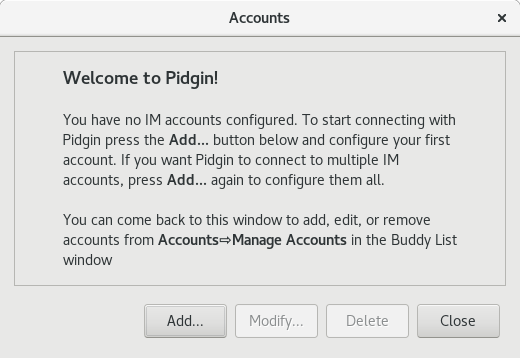 If you start Pidgin for the first time, the account window will open. If you have already configured an account, you can reach this window by clicking Accounts and Manage Accounts. click on Add... to add an account. You need to change the following options. Tick remember password if you don't want to enter your password every time you start Pidgin. 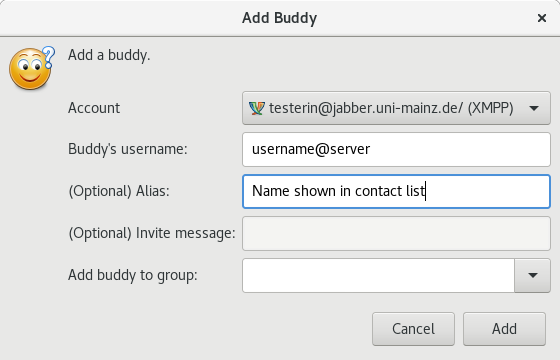 To add a contact click on Buddies and on Add Buddy inside the dropdown menu. Account: If you use multiple accounts you may choose the account you want to add the contact to. Buddy's username: Enter username@server of the contact you want to add. If the person is using a university account the server is jabber.uni-mainz.de. (Optional) Alias: You may enter a name which is shown inside the contact list. 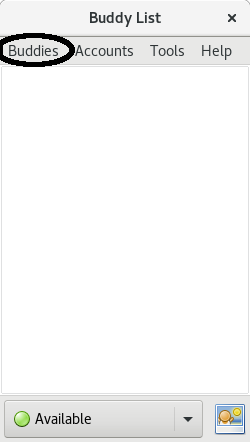 If you leave this field blank the username is shown. If someone adds you to their contact list, you will receive a pop up message asking you to authorize this person. You may allow or deny them to see your online status and additional information.